You can quickly download our cartoons from an email link once you have made your payment. Payment is accepted via credit/debit card or PayPal account. Credit/debit card payments are fulfilled via PayPal. You do not need to sign up for a PayPal account. Find a cartoon and click the 'Purchase' button. Continue shopping or click the 'Checkout' button. Enter your email address and billing details. Enter your Credit Card details in the PayPal interface. You will receive an email with a download link and tax receipt. 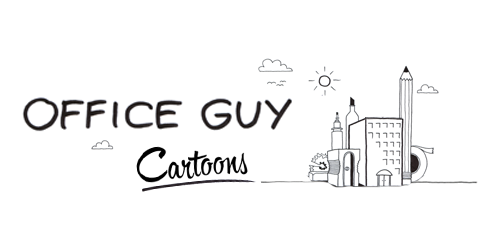 Office Guy Cartoons are great for use in PowerPoint presentations, newsletters, reports, printed documents, social media and blog posts. You can use a cartoon for digital use in accordance with the terms set out in the table below. The cartoon file is a screen resolution 72 dpi .jpg file and will lose quality when printed. Please note that the artist retains ownership of the copyright in the artwork and please ensure the artist's name, copyright and website URL remain on the cartoon. Purchasing a high resolution cartoon is best when you need it for printed or presentation purposes. The cartoon file is a print resolution 300 dpi .jpg file and will print up to A3 size. Usage of the artwork is in accordance with the terms set out in the table below. Please note that the artist retains ownership of the copyright in the artwork and please ensure the artist's name, copyright and website URL remain on the cartoon. Usage of a low resolution cartoon on a website, web forum, blog or social networking site: For use at one URL, where that URL is part of a website, web forum, blog or a social networking site. The Artist (Guy Downes) grants the user and/or purchaser a non-exclusive, limited licence to use the artwork in accordance with these terms and conditions. In the event that the purchaser breaches the terms and conditions the artist has the right to revoke non-exclusive licence. The Artist reserves any usage right not expressly transferred and may grant other users and/or purchasers a non-exclusive licence of the same image. The Artist retains ownership of the copyright in the artwork and the user/purchaser must ensure the Artist's name, copyright and website URL remain on a cartoon. Permission is not granted for the user and/or purchaser to alter, edit, on sell or reproduce the artwork or any of the images exceeding the terms and conditions without the express written consent of the Artist. The user/purchaser undertakes that they will not cause the image to be used in an inappropriate way that may cause harm to the Artist's reputation and or cause the Artist to suffer harm or damage. In the event that the user/purchaser cause the artist harm through a breach of the terms and conditions the user/purchaser acknowledges that they are liable for damage suffered as a result of that breach. In the event that the user/purchaser exceeds the reproduced limit the non-exclusive licence is revoked and the user/purchaser must negotiate with the Artist further terms and conditions for the reproduction of the images. The user/purchaser acknowledges that the Artist will not be liable for any damage suffered by the user/purchaser or by any other party from the use of the images. The user/purchaser acknowledges that they have accepted and agree to be bound by the terms and conditions once they have downloaded and or/purchased a cartoon from the Artist. Usage of a high resolution purchasable cartoon in one PowerPoint presentation, presentation, document, report or newsletter: For use in one PowerPoint presentation, presentation, document, report or newsletter with a reproduction limit of up to 100 only. Advertising, Editorial, Publishing, Marketing and other uses: If you are interested in using a cartoon for online and/or traditional marketing, editorial, advertising, merchandise, books and magazines, or for reproduction limits of over 100 copies, or for another purpose which does not fit into the above categories, please contact Guy with the details. We will quote a price based on your specific use. Original cartoons: If you wish to commission an original cartoon, please contact Guy to discuss your requirements and associated costs.